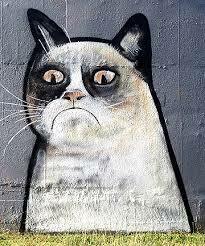 Roskill Community Voice: Grumpy Cat. On her way back? reservoir since Grumpy Cat was removed back in May. In a Board resolution at the August meeting, Michael successfully proposed that the Local Board run a public consultation process to ask local people what should happen next. Would they like Grumpy Cat back? Some other piece of art? Any other ideas? When we get a clear view back from the community we will take this to Watercare for action. The main way to have your say is through this online survey. It only takes a minute or two and means that your views will get heard. As for us, we are definitely Grumpy Cat fans, but we will defer to whatever the community feedback says!